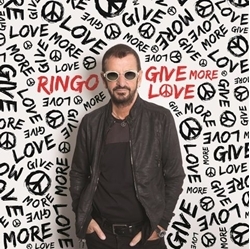 Rev Ranks: Ringo Starr's 'Give More Love' an overly basic letdown | The Daily Reveille. Beatles Radio: The Beatles, Solos, Covers, Birthdays, News The Fab 4 and More! Ringo Starr, famous for being a quarter of the Beatles and one of two still living, released his 19th studio album on Sept. 15 after a two year hiatus. For being such a legendary musician, Starr honestly let me down with this new album, “Give More Love." I had hope for a promising, fruitful album upon listening to the first track, “We’re on the Road Again,” with its triumphant guitars and catchy sound. The lyrics are symbolic of his return to music and touring with this latest release. Former Beatles bandmate Paul McCartney and Eagles’ guitarist Joe Walsh collaborated on this song, which provides all the explanation for why it is arguably one of the album’s best. Yet, the song set up a false pretense that the rest of the album would be as good as the opener.